Tennis Player Arthur Ashe was born July 10th, 1943, he went on to win an astonishing 33 titles, all the while fighting against racism. Gerald R Ford was appointed vice president following the resignation of Spiro T. Agnew, then he became President following the resignation of Richard Nixon, thus becoming the first non-elected vice president and non-elected president in history. There were many many more firsts for the month of July http://www.historyplace.com/specials/calendar/july.htm Click on this link if you are interested in reading more. Now for the really important things! 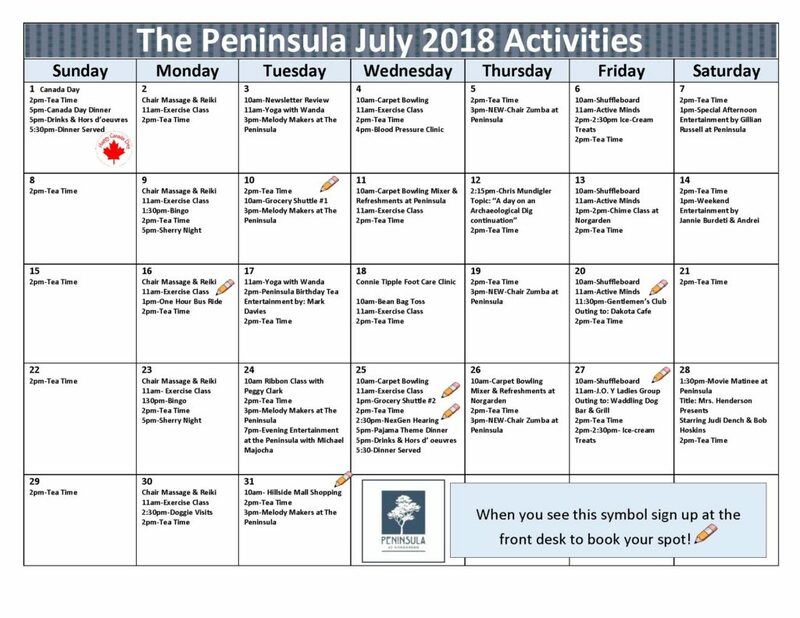 Below are the activities for July at The Peninsula and Norgarden. Ladies Club (J.O.Y. ): Heading to the Waddling Dog on July 27th! If I know Kathleen she will take the scenic route on the way there. Men’s Group: This month they are heading to Dakota Café on July 20th. Close to the Airport with a great view, and the food looks amazing! Both of these trips are very popular and the residents come back sated and smiling. Grocery shuttles: The first one will depart on Tuesday July 10 at 10am. Shuttle #2 will leave on Wednesday July 25 at 1pm. It is a quick one hour trip and an excellent way to shop for the essentials and the “treats”! Hillside Mall is the other shopping destination this month and will depart on Tuesday July 31 at 10am. This trip allows lots of time for shopping, window or otherwise, lunch in the food court and back home by 2:30pm. Peggy Clark, our “next door neighbour at The Peninsula will conduct a ribbon making class. 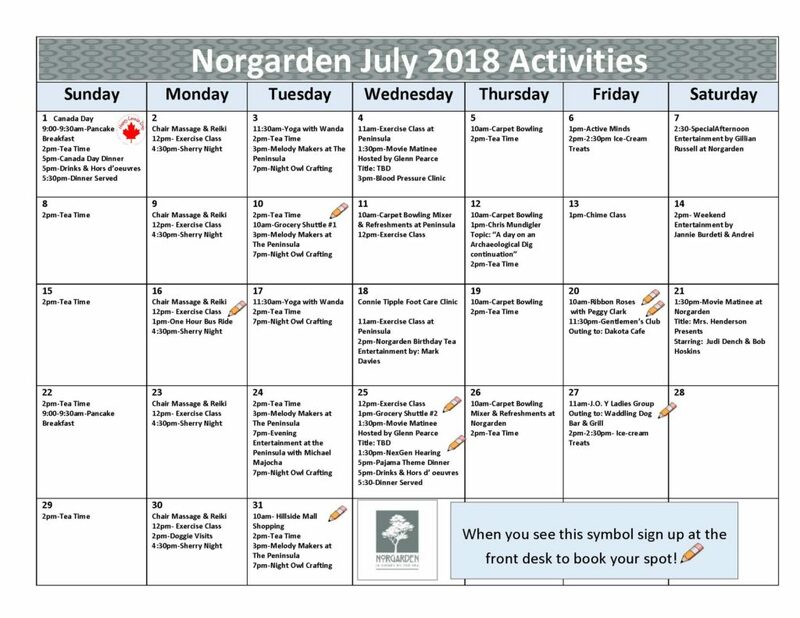 Come join us in the dining room at Norgarden for this fun and ultimately very easy activity. On July 26th the reciprocal party is held at Norgarden. Bowling starts at 10am, followed by end of season festivities at 11am. Even if you have never bowled, this is a welcoming and at times raucous group, so come on down! As always, Kathleen has filled the month of activities for both buildings. Please see below for more offerings. To enlarge the calendars, just click on them.